From our sister press, Lucid Moose Lit! 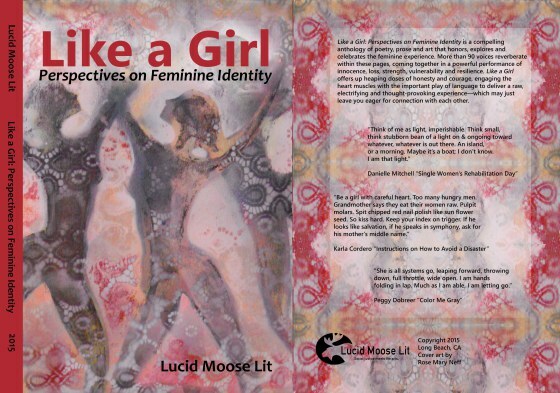 Like a Girl: Perspectives on Feminine Identity is an anthology of poetry, prose, and art based on what it’s like to be a girl. I had the privilege of collaborating with co-editors, Nancy Lynee Woo and Terry Wright, on this year long labor of love. We spent countless hours sorting through hundreds of submissions, painfully narrowing the selections down to this beautiful collection. This has been by far the most challenging project I’ve worked on, stretching and honing my design and layout skills to the next level. The visuals are only half the story. The impact to the heart continues when you read the poems and stories shared by vastly talented people. Each time I get to meet one of the contributors in the book, I feel like I’ve met a old friend part of a grand feminine community.